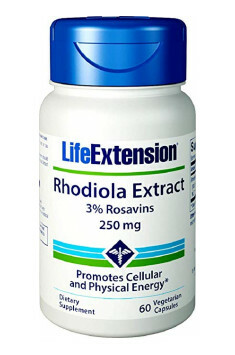 Life Extension Rhodiola Extract is a dietary supplement containing highest-quality extract from Rhodiola rosea root at the amount of 250 mg per one capsule. The extract is characterized by its standardization for the minimum 3% rosavin and 1% salidroside. A stressful situation leads to the changes in central nervous system functioning and HPA axis, which include, among others dysfunctions in the daily rhythm of cortisol release and decrease of serotonin concentration in the hypothalamus. All of this aims at supporting the organism in dealing with stressors. However, in the cases, where a stressful situation is prolonged, hormones may lead to many diseases and also brain cells death in hippocampus – basic structure in the processes of learning and remembering. Rhodiola rosea – also called a golden root; a curative plant claimed to be one of the most promising resources with adaptogenic effect; restores organism homeostasis by increasing resilience to diseases, improving reactions to stress situations and facilitating fast recovery of physiological norms after stressors subside. It also exhibits cardioprotective, immunostimulating, hepatoprotective and antioxidant effects. Moreover, it turns out to be effective in sexual disorders prophylaxis, stabilizes sugar level in blood (improves cells sensitivity to insulin) and increases sportsmen efficiency – promotes anabolic processes and stimulates effective utilization of energy reserves. Adaptogen is a plant, which contributes to the growth of organism immunity against stressful physical, chemical and biological factors through normalization of various organs and systems work in the organism. Adaptogenic properties of Rhodiola rosea extracts are probably connected to their ability to influence the hypothalamic–pituitary–adrenal axis (HPA) and adregenic sympathetic nervous system. Rhodiola rosea extract contributes to improving unspecific resilience to stressors, primarily thanks to improving serotonin level in the hypothalamus and midbrain. Moreover, it influences certain elements of cellular response system to stress, e.g. by the increase of beta-endorphins in blood plasma and inhibiting releasing opioid peptides and corticotropin-releasing factor (CRF) freeing corticotropic hormone in response to a stressful situation, which secures nervous and cardiovascular system from damage. Cardioprotective effect of Rhodiola rosea extracts consists primarily in protecting heart from stress factors, which may lead to damaging this organ, e.g. free radicals. What is more, rhiodola increases heart muscle cells reserves and activates specific opioid receptors in the heart muscle, thanks to which it protects the heart from arrhythmia, decreases local ischemias and normalizes blood pressure. The crucial meaning in this action have phenylpropanoids, such as rosavin and phenolic compounds (salidroside with p-thyrozol). The research was carried out using Rhodiola rosea among 56 doctors during their night shifts. They were being administered 170 mg of extract containing 4.5 mg of salidroside for the period of 14 days. During the experiment, their intellectual efficiency was evaluated, and more precisely: the concentration ability, short-term memory, association ability, audiovisual perception and the level of mental fatigue. The result of the study was unambiguous and confirmed the increase of brain cognitive functions by 20% in comparison to the group taking placebo. In another study carried out on the group of male students during exam session, a 20-day supplementation was applied with 50 mg Rhodiola rosea extract. After this time, specialist measurements were conducted. What was observed were: significant physical and psychomotor efficiency, decrease of sleepiness and fatigue, generally better self-being and a better motivation to study. Summing up, Jarrow Rhodiola Rosea is a supplement recommended primarily as a remedy to long-lasting fatigue states, lowered self-being, homeostasis disturbance caused by permanent stress and as a means to decrease cortisol level and restore proper adrenal glands functions. Moreover, the product is recommended to students, research workers and sportsmen with the aim of increasing psychophysical and psychomotor efficiency. One capsule once a day, during a meal. Rhodiola improves physical and mental efficiency, reduces fatigue in situations of prolonged stress. Rhodiola also has neuroprotective effect and according to preliminary studies, it has potential to prolong life. Supplementation is usually used in form of extract of SHR-5(or its equivalent), or an extract containing 3% Rosavins and 1% salidroside. The dose of 50 mg is enough to prevent fatigue. Taking Rhodiola ad hoc,in the case of stress, is effective in doses about 288-680 mg.